Patient started treatment at age 11 and wore braces for 26 months. He loves his new smile. Patient sucked her thumb as a young child. She started treatment at age 13. She had braces and a special appliance — called a crib — to retrain the tongue, for 28 months. Now she can bite the lettuce out of a sandwich. This adult patient, age 25, required braces and jaw surgery to correct his severe overbite, with treatment taking two years. His problem could have been corrected without surgery if he had been treated before he was a teenager. This patient's lateral incisors were congenitally missing. 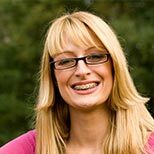 She had braces for 20 months to move the teeth into their correct positions, then the missing teeth were replaced with bonded "Maryland" bridges. Patient's underbite was causing her jaw joint discomfort and excessive wear patterns on her teeth. After about 30 months of treatment starting at age 32, she now finds smiling and chewing much easier. 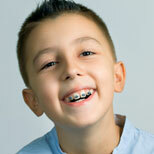 At age ten, patient had a big overjet with the top teeth protruding beyond the bottom. She had two phases of treatment. The first helped her jaws to grow more harmoniously and the second aligned her teeth and bite. At age 13, she was proudly displaying her new smile. 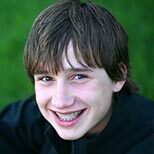 Patient's parents were concerned about both aesthetics and the health of the erupting permanent teeth when they brought him to the orthodontist at age eight. The lower front teeth were crowded and touching the palate, and the upper front teeth were extremely displaced from their normal positions. After 12 months of Phase-One treatment with an expander and partial braces, patient's appearance and dental function were vastly improved. 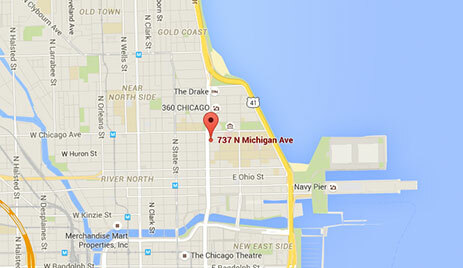 “I am greatly selective about where I refer my patients. When I need an orthodontist, I send them to Dr. Huang. He is skillful, brilliant and up to date with technology.”~ Neal N.
“Dr. Huang and his entire staff are fabulous beyond measure. I had to endure braces twice in my earlier life and it was not until Dr. Huang treated me that I got a perfect result. I recommend Gold Coast without hesitation Professional, friendly. always punctual, utilizing the latest technology! Just terriﬁc care!”~ Linda N.
“I had a terrible experience In Indianapolis with my Invisalign procedures. Moved back to Chicago and for the second time got Invisalign( braces) for my teeth. The experience and improvement on my teeth were 100XXX better. I recommend Gold Coast! Dr. Huang and his team are delighful! 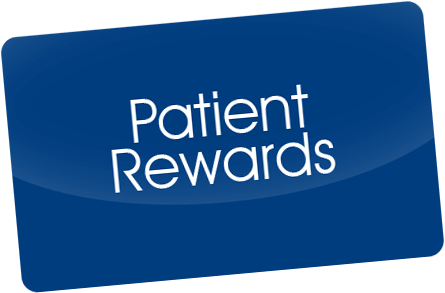 My teeth look great!”~ Eve K.
Earn rewards for being a great patient, and show off that incredible smile!